Productivity Puzzle Solved: Central Banks, Again! 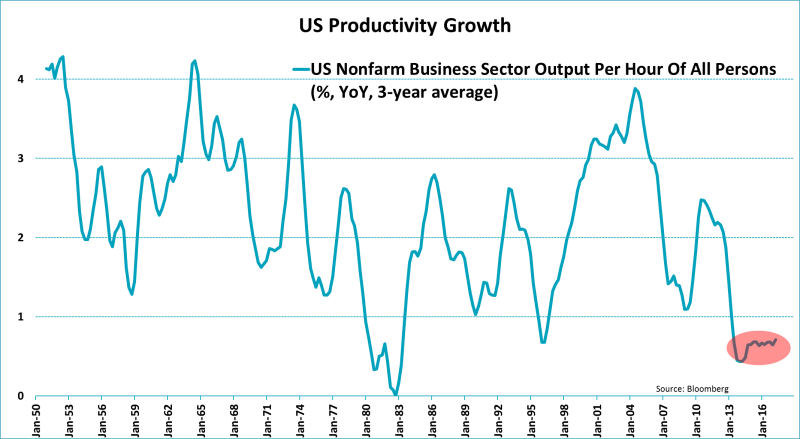 Productivity growth has dropped to alarmingly low levels. And not just in the US, where the figure has remained below 1% in recent years(! ), but also in France and the UK. Even in Germany has the output per hour, the mostly widely used productivity measure, risen only marginally since the financial crisis. The sluggish pace of productivity growth is surely bad news. In a world with an aging − and thus, shrinking − workforce, productivity growth is basically the only available engine to make your economy grow faster. Hence, economists are desperately trying to explain why productivity is growing so slowly. One obvious reason is innovation. History, take the industrial revolution as one of the best examples, has taught us that technological innovation tends to boost productivity. That’s why some economists, including Robert Gordon, claim that weak productivity growth can simply be attributed to a decline in sound technological innovation. But ‘evidence’ that this conclusion is premature can be found all around us. On an almost daily basis, companies like Amazon and Google, but also companies like Tesla and Samsung, are demonstrating that there’s certainly sufficient innovation to stimulate productivity. Next to that a great number of fintech, biotech and alternative energy businesses are launching promising new technologies that should boost productivity. Low productivity puzzle? Try the aftermath of the financial crisis and how central banks (there they are again) responded to it. After the financial sector almost fell in the abyss in 2008, banks were reluctant to fulfill what used to be their main role − that of money-lender. The regulations introduced in the years to follow, particularly regarding capital buffer requirements, placed further limitations on lending to companies. 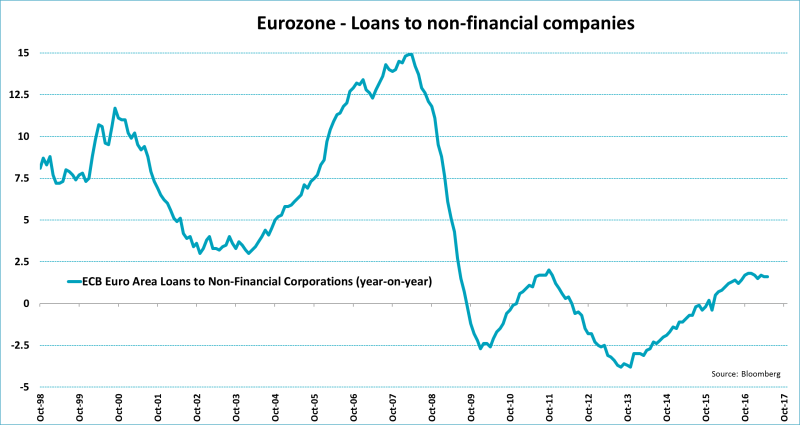 The graph below shows that to this day, growth in Eurozone corporate lending is considerably slower than before the financial crisis. So it goes without saying that at least some technological innovation has been lost, if for no other reason than that there simply wasn’t enough capital available to make the necessary investments. But that’s not all! The effects of the financial crisis ‘forced’ central banks all over the world to participate in a financial experiment that pushed interest rates down to extremely low − at times even negative − levels. These ultra-low rates meant that weak, non-innovative companies were still able to survive. 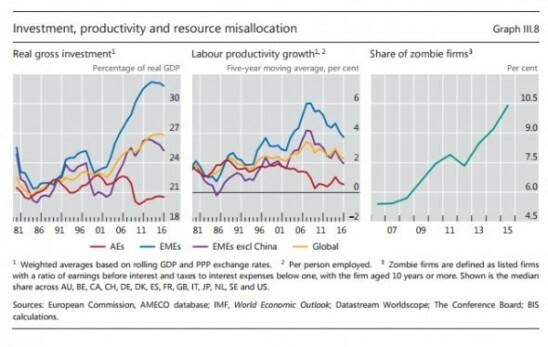 In other words, the extreme measures implemented by central banks hamper productivity growth today because they allow ‘zombie firms’ to survive longer than they would otherwise. That’s exactly the comparison being made in the graph below, which comes from the Bank of International Settlement’s most recent annual report. Incidentally, central banks, well, some of them at least, do not deny this reasoning. Recently, the Bank of England acknowledged that productivity would have risen between one and three percentage points more if the central bank had raised interest rates to pre-crisis levels. However, this would have increased the unemployment rate, which, according to the bank, was unacceptable. Low productivity growth is yet another example that shows just how far-reaching the effects of extreme central bank policies can be. And yet the reversal of the policies has yet to come.